So, you wanna play a dice game? 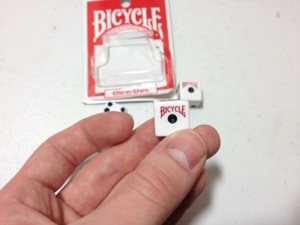 Perhaps you lost a few dice from your favorite board game. What do you do? 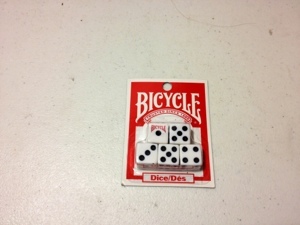 If your answer was go to the store and look for dice you might come across a pack of five Bicycle brand dice for a buck. How could you go wrong with dice? I do know how I can tell you that this set has no problems. They are solid and nice, being the perfect size for fitting in the hand. They are durable little things with well-applied paint that doesn’t like to rub off. They roll great, don’t slip in ones hand and make that satisfying dice sound. I mean, they’re dice, there is almost no way they could be screwed up. And these are the best of not being screwed up. If you need a few dice, go with these.